Its freezing outside & schools are closed. We needed groceries but I was NOT venturing out in this. I love having groceries delivered to my door. We have been enjoying Home Chef, which is currently running FREE $30 Credit. These make me look like a real chef when in reality I am just a stay at home Mom during a winter break! Enjoy this Sicilian Shrimp Risotto meal with broiled tomatoes & breadcrumbs. Add the garlic, tomatoes, cilantro, olive oil and salt and pepper to a cooking sheet. Broil on LOW for 5-10 minutes. Add the shrimp to a frying pan with olive oil. Cook until it is pink in color. Cook your rice due to the package instructions. Then add the tomatoes to the shrimp frying pan. Plate by added the rice first and the shrimp mixture on top. 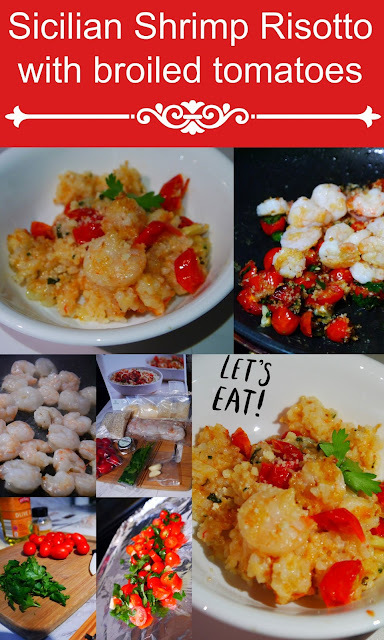 This is a easy dish to make and my picky family LOVED it!!! Have yo tried Home Chef yet?? Here is a $30 credit, just CLICK!! What dishes should we try out next?? This looks really yummy. I'm not a huge shrimp fan, but my family just LOVES it! This looks amazing! Love meal delivery services on nights where it's hard to even think about making a meal! Those broiled tomatoes look awesome! I imagine that broiling them really brings out the flavor. This looks like a delicious dish! I haven't cooked risotto in ages and this sounds yummy. What Hockey Equipment do You Need to get Started?